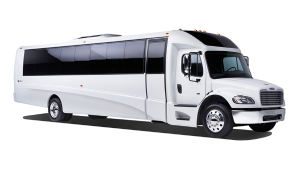 As one of our largest minibus options, the 25-passenger model is perfect for traveling groups who don’t quite need the space of a 56-passenger coach but still want to stay organized on one vehicle. With air conditioning, plush seating, plenty of legroom, and entertainment add-ons, this compact coach is perfect for your next group trip. Total Charters is your go-to source for reliable bus rentals across the Midwest. With experience in providing travel services to wedding parties, corporate travelers, school groups, sports teams, assisted living communities, and more, we’re always able to provide your group with the perfect accommodations. We service major areas such as Indianapolis, Chicago, Detroit, and St. Louis, with service also extending to Bloomington, Lexington, and Louisville. No matter what type of trip you have planned, we’ll make sure you’re paired with the best bus rental at the best price. Call us at 1-866-303-2594 to get started on your rental today!